I'm Dom. This is my story. It was 1998. I was working with the largest trade union labor center in the Philippines. One of my duties was to look at how to improve public services and actions to migrant workers. I met with a group of Overseas Filipino Workers or OFWs from the Middle East. The OFWs wanted their contracts enforced. Their salaries were lesser than the amount in their contracts, two or more months after they were due. Abused domestic workers ran away from their employers. And many more issues. For three years, meetings with OFWs and their families exposed me to their concerns. These meetings came up with proposed changes to the Migrant Workers and Overseas Filipinos Act. The aim was to improve law and practice on OFWs. We at the labor center built contacts with key government agencies dealing with OFWs, such as POEA and OWWA. These have mandates to serve migrant workers. The challenge was, and still is, to spread the agencies’ processes for easier and faster delivery of services. We also began programs and services for migrant workers. We founded an apex organization of OFWs and returnees. This would help migrant workers fight for their rights and get better services. The organization was not able to sustain itself, but the concerns of OFWs and their need for prompt service stayed with me. “Why not build a one-stop website for current and future OFWs and Filipino immigrants?”, I asked myself. The challenge was how to put up a website that my target audience could find and to earn from it as well. I knew basic HTML writing but other techie matters on building a website were alien to me. Then I found SBI!, a tool which allows non-tech persons like me to build websites and online businesses based on topics they know and love. It uses a process with the basic reality of the internet. People use the internet to look for information and solution. They turn to search engines such as Google, Yahoo or Bing and type keywords to look for that information. SBI! has over 40,000 clients who build their websites and online businesses with this tool and process. The income from their websites gives them freedom to live their dreams. I was hooked. On 15 May 2009, the homepage was up and running. I kept on building pages during my spare time. Before 2009 ended, the website was paying for itself. And the number of subscribers kept growing. In 2013, my wife landed a job in Singapore at the Asia Pacific office of the largest global trade union group. She would handle women and gender concerns. I joined her while I was waiting for the result of my application for a master’s degree at the S. Rajaratnam School of International Studies (RSIS) at the Nanyang Technological University (NTU). RSIS aims to “be a leading research and graduate teaching institution in strategic and international affairs in the Asia Pacific” (RSIS website) while NTU is “consistently ranked among the world's best in various college and university rankings” (Wikipedia). I went to RSIS in July 2013 and over the next 12 months I studied International Political Economy with focus in Asia/Southeast Asia. This course tackles the link between politics and economics. This means that, among other things, a policy decision comes with winners and losers, mostly in favor of those wielding power. After graduate school, the grouping of 18 national labor centers in ASEAN (Association of Southeast Asian Nations) engaged me for its project about migrant workers. One worthy result: the labor centers in both sending and host countries in ASEAN agreed to help migrant workers through an inter-union pact. Distressed OFWs in ASEAN can now seek the help of the concerned labor centers. 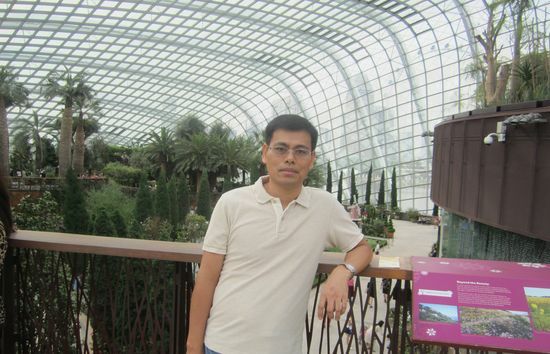 This is me at the Singapore Flower Dome. Overseas-Filipinos.com’s number of readers is growing. I am proud to have begun a website that helps OFWs and Filipino immigrants. I can now relate more to OFW concerns. I handle programs about migrant workers in ASEAN and I myself am working in Singapore. I am tweaking the website. Its look and feel is changing for a more-user-friendly visit. Some pages have many bars at the left side. But all pages should look the same over time. I still write pages during my free time. I barely scratched the surface of topics useful to OFWs, Filipino immigrants and their families. Over the coming years Overseas-Filipinos.com will expand. If you would like certain topics to see on the website, please let me know here. Working on Overseas-Filipinos.com and being an OFW in Singapore is a challenge. I would like to help other OFWs through this website. Luckily, the wider social, tech and business world offers space without limits. Besides, I enjoy being here, with my wife.